AND THEN THERE ARE THE OTHER 95% OF ANIMALS - From an entomologist's perspective, the Top End is very much frontier country. It is tropical, seasonally wet or flooded but mostly dry for much of the year. This has produced a very unique habitat, and flora and fauna. 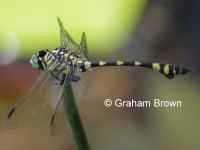 The Australian Tiger is one of the larger dragonflies in the Top End and is easily recognised by the eyes separated above and the swollen tip to the abdomen especially in the male. It found around ponds, lakes and other slow moving waters. 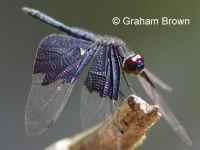 The Iridescent Flutterer is one of the few Top End species that has the basal half of the wings black. This occurs in both sexes while it is absent in the females of the other two species. It likes ponds and streams. The Graphic Flutter is a distinctively coloured species. It occurs in large numbers and April and May and are thought to migrate north to Indonesia for the dry season here. 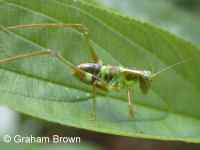 Polichne katydids have a narrow body and are found in grasslands or forest clearings or edges. They are plant feeders and have nymphs that are ant mimics. 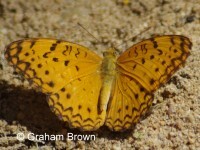 This species, Polichne parvicauda is the most widely distributed species in the genus and is brown rather than green like most other species. Many katydid nymphs are unusually coloured, especially the smaller nymphs. This is to protect them from predators, either so blend into the background, or resemble something that bites or stings such as ants. This is a species of Polichne. 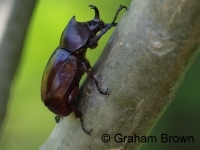 The Rhinocerus Beetle is one of the largest scarabs in the Top End. 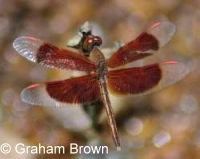 Males have curved horns on the head and the thorax, but these are absent in the female. The larvae are known as curl grubs and live in rotting vegetation and compost heads. 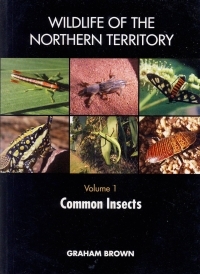 There are 78 species of mosquitoes in the Northern Territory with most restricted to the Top End. Their presence is dependant on the seasons and their numbers by the availability of water including rain and high tides. 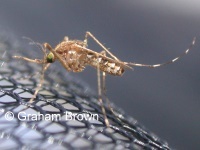 Not all species will bite humans and one is the larvae of one is a predator of other mosquito larvae. Caper Gull is one of the whites that has different colour forms in Wet and Dry Seasons. The larvae fod on capparis. The Spotted Rustic only occurs in the western Top End and are particularly common in May and the late Dry Season. The lavae feed on Flacourtia in monsoon forest. 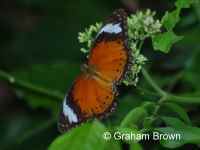 The Orange Lacewing is a rainforest species, the caterpillars of which feed on native passionfruit. It has a patchy distribution but may be common where it does occur. The Atlas moth is the second largest moth in Australia. It was once common but is now rarely seen. 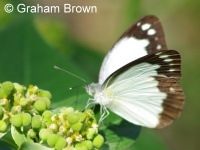 It is associated with rainforest where the large grey-white larvae feed on the leaves of rainforest shrubs and trees. 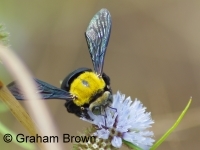 There are three species of Carpenter Bee in the Top End. These are our largest bees growing to abot 2cm. 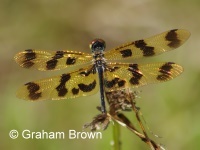 Females are glossy black with dense yellow hairs on the thorax and cannot be easily identified to species. Males are yellow-green with the colour varying with colour but rarely seen. As the name suggests, they build nests in dead branches. Females chew a round hole in vertical soft-wood branches and then bore down. They fill this tunnel successively with cells filled with pollen and a single egg. This is usually filled with about 6 cells, and when this is done, the female bores upwards to construct a tunnel for a further two cells. 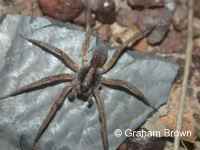 Lycosa sp., one of the many ground-dwelling species of wolf spiders. They are active at night and are fast runners. Their eyes reflect light and are easily spotted when wearing a light on the head at night. 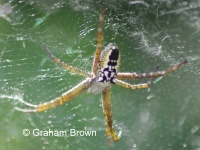 The Moluccan Tent-spider spins a orb web that is horizontal with the centre raised to form a conical, tent-like web. Often this spider occurs in large aggregations of webs that are joined and covered with additional silk. 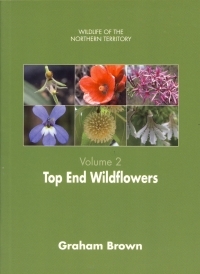 It occurs throughout northern Australia in damper areas. Males are much smaller than the female shown here. Xanthomelon is a genus of large native snails. They are rainforest species and are common. 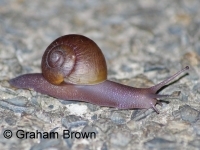 Snail are only active at night and during the wet season. They aestivate in the dry season. Specimens that wander too far from rainfores before the Dry Season may be forced to remain there. As such they are more succeptable to predation and bushfires. it is the resulting empty shells that are more frequently seen rather than the live animal. Swainson's Snake-eyed skink, Cryptoblepharus cygnorum, is one of 13 species of Snake-eyed skinks in the Northern Territory. It is found on tree trunks, stumps and the outside of buildings and is common. Although it is active during the day, it may be found below lights where it feeds on insects and anything else that is small enough to overpower and eat. It ranges from Darwin to Kakadu NP and Arnhem land. Two other species occur within its range: the similar-looking and more widely spread Metallic snake-eyed Skink and the Spangled snake-eyed skink. 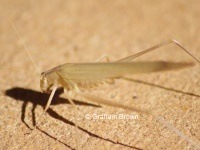 The latter is only known from Mt Borradaile in Western Arnhem Land and lives on rocky outcrops.